First, I had some of the homemade vanilla because this was cited as the bestseller of the Blue Bell Ice Cream flavors by Andrew Evans in an article that came out on the Digital Nomad section of National Geographic. Since I’m not a fan of vanilla flavored ice cream products, or at least the ones I’ve previously tasted and that included local and imported brands, I had been prepared to dislike Blue Bell Ice Cream’s version as well. Surprisingly, I like, no, love Blue Bell’s homemade vanilla ice cream. I now understand why it is a company bestseller. It was the goodness of milk and cream and sugar plus a whole lot of ingredients, I’m sure, made into ice cream. My other favorites are banana pudding and banana split. You can taste the banana in both Blue Bell ice cream flavors, and there are fruit bits in the split while the pudding was fairly starchy in texture. The strawberry, cookies ‘n cream, and rocky road flavors are good, too. I managed to taste six of the 14 flavors made available during the Blue Bell country fair-themed ice cream tasting party at Ayala Center Cebu yesterday before my mouth decided it couldn’t take any more. I brought home some butter crunch but I haven’t eaten it yet. My only regret is not being able to try out the red velvet and krazy kookie dough. Other flavors available in Cebu, for now, are chocolate chip cookie dough, Dutch chocolate, moo-llennium crunch, rocky mountain road, and strawberries and homemade vanilla. 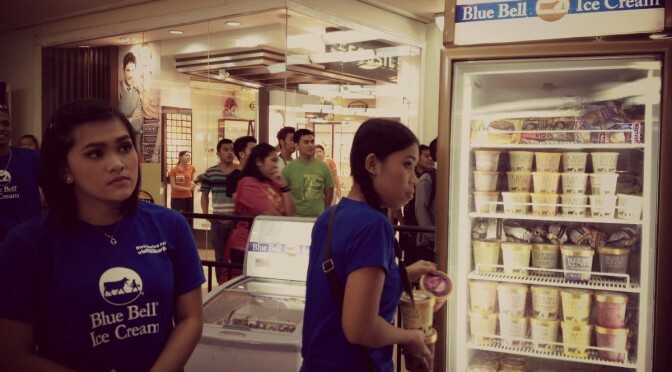 Visfood Corporation, exclusive distributor in the Visayas and Mindanao, is selling Blue Bell ice cream products in Cebu before anywhere else in the Philippines, even Manila. Lucky us! Why Cebu? Jeff Puno of Visfood Corp. said they’re marketing Blue Bell here first knowing that if it works in Cebu, especially with the Cebuanos’ value for money mindset, it will work anywhere in the Philippines. He added that it took them a year to convince the Blue Bell Creameries in Brenham, Texas to distribute its ice cream in the Philippines. “Blue Bell is a very conservative company and very particular about product handling concerns. It’s not even in 50 states of the US,” he explained, adding that Blue Bell’s concerns revolve around ensuring its ice cream products retain the same quality when these are sold in the Philippines. Except for some Middle East countries, Puno said he couldn’t think of any other place distributing Blue Bell Ice Cream in Asia-Pacific as the company has not fully explored the region as a market for its products. Another good news, according to Visfood Corp. general manager Aina P. Sanchez, is the opening soon of a scooping station in Cebu. Jeff Puno said the beauty of a scooping station is it will be able to carry all Blue Bell Ice Cream flavors, including seasonal ones. Sanchez added they started selling Blue Bell products in Cebu store outlets just this September. What makes the Blue Bell Ice Cream special is it uses only the freshest ingredients, Ebe R. Puno of Visfood Corp. revealed. The company produces its own milk and bakes the ingredients that go into the ice cream, such as the cookies in the cookies ‘n cream. Jeff Puno added that Blue Bell is the third best-selling ice cream in the US but it is number one in all 22 states where it sells its products. The Blue Bell Ice Cream will be sold in Manila soon, too, through Visfood Corporation’s sister-company Circle City Sales, said Sanchez. In Visayas, immediate expansion plans will include Dumaguete, Bacolod, Iloilo, and Boracay, she added. Blue Bell Ice CreamVisfood Corp.